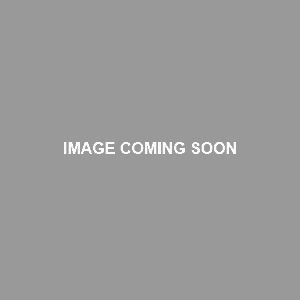 The rhomboid major and minor (L. rhomboideus, parallelogram ; major, larger ; minor, smaller.) are two muscles located between the shoulder blades and spinal column. If you took geometry, you might’ve guessed that they’re named after the rhombus shape, which they both resemble. Acting on the shoulder blades, both of these muscles are prime movers in scapular retraction and scapular downward rotation. The rhomboids are part of the deep posterior axioappendicular (extrinsic shoulder) muscle group. They’re situated inferior to the levator scapulae, superior to the lats, deep to the middle trapezius, and superficial to the serratus posterior superior and thoracic spinal erectors. The rhomboids originate from the lower cervical and upper thoracic vertebrae. The parallel-oriented fibers of both muscles run inferolaterally and insert on the medial border of the scapula, forming flat quadrate muscle architectures. Note: The table below only includes exercises featuring scapular retraction, since that is what targets the rhomboids most directly. These are the exact same exercises that target the middle trapezius. The rhomboids are trained more indirectly in rear deltoid exercises and lat exercises. These are the same techniques use to stretch the middle trapezius fibers. Inhibited/Lengthened Rhomboids: The rhomboid major and rhomboid minor are both inhibited and lengthened in individuals with upper crossed syndrome (UCS). The scapular protraction that goes hand in hand with UCS puts the rhomboids in a chronically stretched out and inhibited state. At the same time, this facilitates the pectoralis minor, which is an antagonist of the rhomboids during scapular retraction. This can result in reduced range of motion and weakness during scapular retraction. This increases risk of shoulder injury on bench press due to the inability to keep your shoulder blades packed down and together in order to stabilize your shoulder girdle. Additionally, the pec minor will become synergistically dominant over the rhomboids in movements involving scapular downward rotation, where they would normally work together. 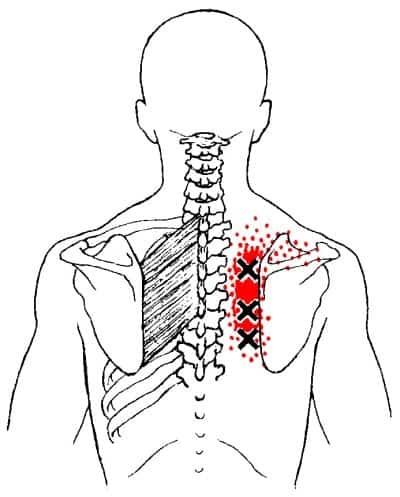 This can cause poor technique and shoulder instability during exercises like pull ups and lat pulldowns. Overactive/Short Rhomboids: While not as common as inhibition/excessive lengthening, the rhomboids can become overactive and shorter in some cases. Specifically, this tends to happen most in powerlifters who do a disproportionate amount of training volume on exercises involving the movement of scapular retraction (e.g. row variations), combined with a lot volume on exercises where the position of scapular retraction is statically held (i.e. bench press variations). 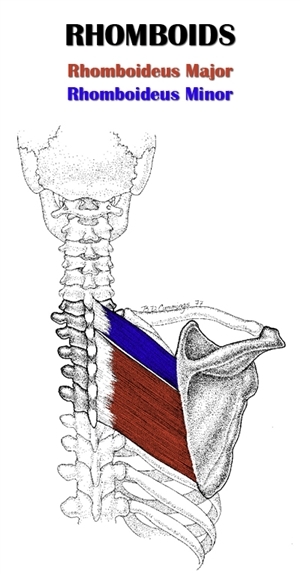 This causes “rhomboid dominance,” where the rhomboids become tighter and shorter, and the serratus anterior becomes inhibited and lengthened since the scapulae are constantly pulling against it. Since the serratus anterior plays such an important role in arm elevation (via scapular upward rotation), the biggest negative impact of rhomboid dominance is that it can restrict overhead mobility. Increase training volume and training frequency on direct rhomboid/mid trap exercises. If you have a lot of difficulty getting the scapulae to retract during rows, do exercises that will focus specifically on improve motor control during scapular retraction – For this, I recommend incline shrugs and unilateral incline T raise. Gradually increase the weight over time. Once you feel strong enough with scapular, start integrating different row variation with light weight, and go from there. Release and stretch the pectoralis minor, pectoralis major and latissimus dorsi. These are the muscles most responsible for inhibiting the rhomboids. The above bullet points are a good start for treating your rhomboids dysfunction. As mentioned earlier, upper crossed syndrome is often the source of the problem. If this is the case in your situation, refer to how to fix upper crossed syndrome (article coming soon). Decrease your total training volume on row variations (which involve the movement of retraction) and bench press variations (which involve holding the static position of retraction). Release and stretch your rhomboids on a daily basis, especially after doing exercises that train them. Increase your training volume and training frequency on serratus anterior exercises. Allow your scapulae to fully protract at the bottom of the rep on row exercises. Don’t hold it in that position for an extended period of time, since letting a heavy load pull against it like that could be potentially harmful. Rather, allow the scapulae to go to the end of the protraction range of motion for just a moment before pulling the weight back up. If your lower trapezius muscles are also inhibited/long, start doing exercises to activate and strengthen them. The Y raise exercise will isolate them. Overhead shrugs will train them along with the serratus anterior. See lower trapezius exercises for more options. During the concentric rep, focus on retracting your scapulae, while keeping them depressed. Your should feel your rhomboids doing a lot of the work. You should also feel the lower trapezius contracting isometrically since they are working to keep the lower trapezius depressed. Maintain thoracic extension to allow proper movement of the scapulae over the ribs. For rows, don’t rely on your arms to pull the weight up. If you can’t fully retract your scapulae and feel it in your back, then you need to reduce the weight and work on your technique. pictures on the exercises and stretches would be very beneficial!! Hi Kody, I appreciate the feedback. I definitely want to add pictures in the future. I’ve got a long to-do list for content, and this is on it.